Its so easy to fall in love with this beautiful country and it’s people. 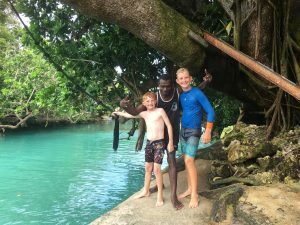 Check out the list of Things to do in Vanuatu recommended by Caroline – traveler, marketer and lover of Vanuatu. 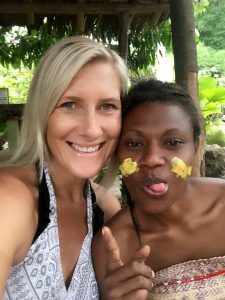 Vanuatu is a must travel to destination offering so many Magical Experiences. 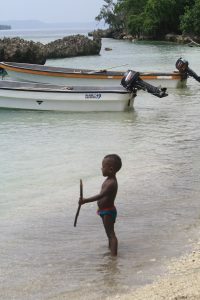 It is clear that I love VANUATU, travelling here three times in the last 15 months. 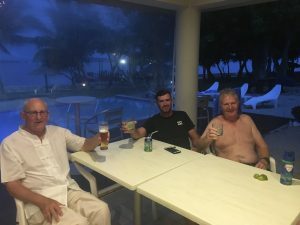 On my most recent trip I took my father Chris (age 82) and two boys Saxon (aged 13) and Ryder (aged 11). One of the great things about this amazing destination is it is perfect for all age groups. 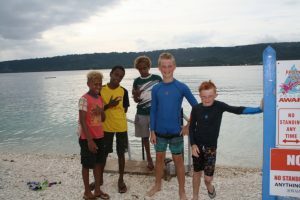 It was their first time to Vanuatu so I was excited to show them things to do in Vanuatu. 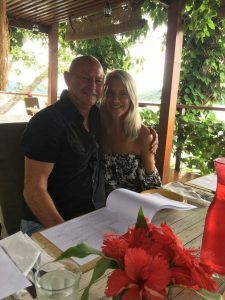 We chose to stay at Island Magic Resort as ‘its like a Home away from Home’ with fully self contained two bedroom bungalows on the beach, perfect for couples or families, sleeping up to 5 people. Island Magic Resort is in the best location, only 15 minutes drive to the town of Port Vila. 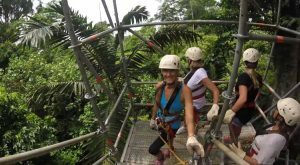 It is literally across the road from major attractions such as Wet n Wild Adventure Park, and Vanuatu Jungle Zipline. 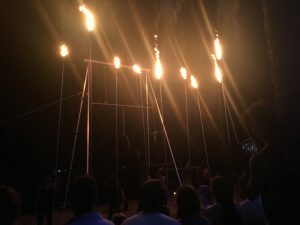 Close to the Beach Bar with the famous Friday night fire show and approx 5 minutes to the Secret Garden Cultural Village and Mele Cascades Waterfall. 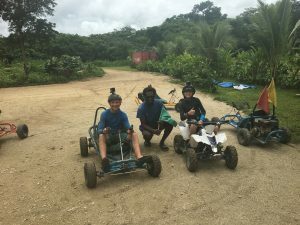 There is so much to do and see in Vanuatu, here’s a list for YOU of great ‘Things to Do in Vanuatu! 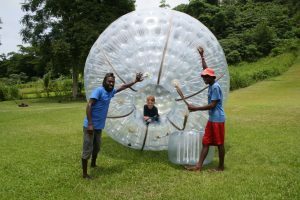 One of the most exciting activities in Vanuatu. BEST of all its just down the road from Island Magic Resort so you can choose to walk or the bus will pick you up out the front of resort. To start the guides get you suited up with a harness, helmet, and gloves. Don’t forget to bring your camera and GoPros, (they have helmet clips and bags to strap your phones on your harness). It is clear that safety is paramount here, the guides do many safety checks and ensure your gear is on correctly. 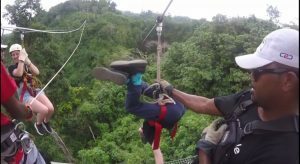 The Zipline is a continuous belay system so once your on you cant get off with numerous different ziplines that take you through various jungle canopy’s high in the trees. 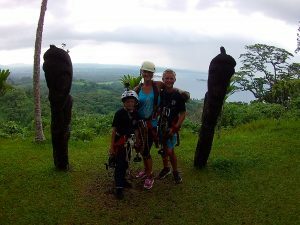 The views are breathtaking overlooking Mele Bay and Port Vila. 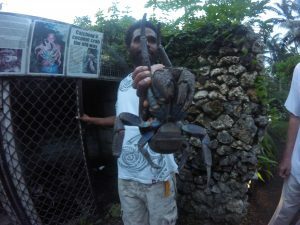 I highly recommend this experience whilst in Vanuatu. Check out the website below or book with one of our friendly staff at reception. 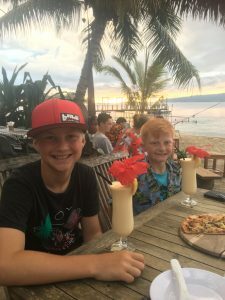 The Beach Bar is situated right on the beach at Mele Bay with safe swimming in crystal clear waters with a beautiful view and some of the best sunsets I have ever seen. Every Friday night at the Beach Bar it comes alive with an amazing cultural Fire Dance Show. Best to get there early, and book a table for dinner and drinks beforehand to get a good spot. It is a fun night of fire magic with a mix of choreographed fire dancing to contemporary music. 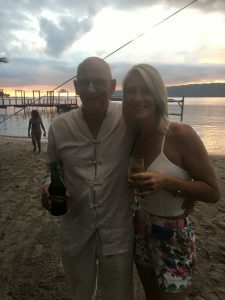 The visuals of light, fire and dance are spectacular, the food, drinks and atmosphere make this one of the BEST nights in Vanuatu. The show is FREE but donations are welcomed to the group of dancers . You can spend ALL day here. Wet n Wild Adventure park have Go carts, waterslide, zorb balls, virtual reality pod, human slingshot, segways and more. Best of all, it’s across the road from Island Magic Resort! 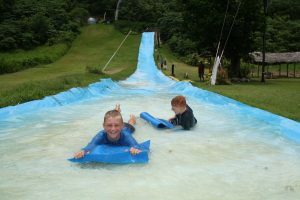 The kids will never get bored with unlimited activities. 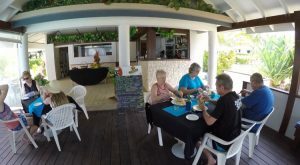 Onsite at Island Magic Resort is an amazing restaurant called Coco De Mer. Dinner and Drinks by the pool watching the sun go down with tunes in the background is magical. It’s a great way to mingle with other guests and meet the friendly and helpful onsite managers Gerry and Jan. This is a great half day out, only a short drive from Island Magic Resort. Greeted by our local guide who took us along the walking track up to the Waterfall. Some of the rocks were a little slippery but it was a fairly easy to moderate walk. There were lots of stops on the way to take photographs and have a swim. 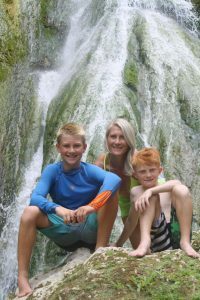 The best spot was at the top where we dived into the water and swum underneath the waterfall and into a little cave area. The water is clear, clean and refreshing! 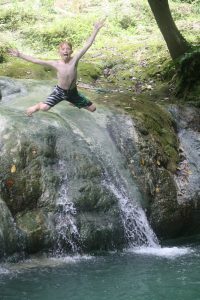 What a wonderful experience it is here at Mele Cascades. It has to be experienced to be fully appreciated, relive your childhood memories. The colour of the water is a magical blue, hence the name Blue Lagoon. Great spot to bring a picnic with lots of seating areas and shade. There are two main rope swings one on each side of the lagoon which are great fun for kids and adults. 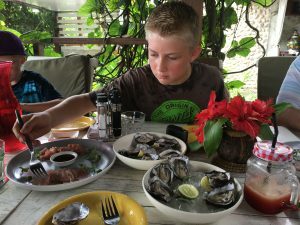 It is about a half hour drive here from Port Vila and so worth it! From the moment you walk through the beautiful entrance lined with frangipani flowers, and the fresh aromas coming out of the kitchen, your senses come alive. 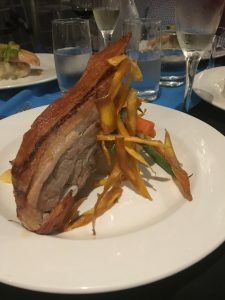 The food, the ambience, the location, the music, the drinks, the staff, the musicians, the service from the owner and creator Francesca, the ocean view, the decor, It’s easy to see why this is my fathers favourite place in Vanuatu. 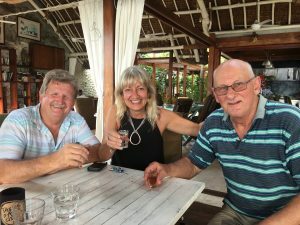 On every Sunday they have a duo singing (local Prince Phillip) and talented singer and keyboard player (Jimmy), with a range of music from oldies to more modern style, the restaurant soon becomes a dance floor after lunch. 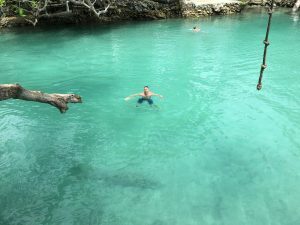 Whilst the adults dance and sing the kids can swim out the front in the protected Havannah Harbour with crystal clear water. This will be one of your unforgettable days eating great food and socialising with beautiful people. Really interesting place here at Secret Garden with the Jungle Restaurant and Cultural Centre. The restaurant serves good food and cold Tusker. 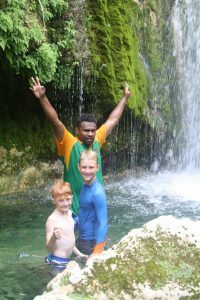 The staff are fantastic with amazing knowledge about the history of Vanuatu and it’s people. The Cultural dance show is a must see. Hideaway Island is a few minutes boat ride from the mainland across to the little Island. 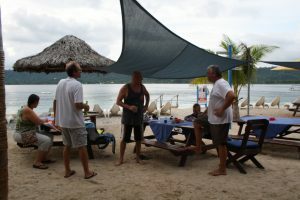 The beach, snorkeling, swimming and beach bar here are fantastic. Our favourite part of the day was writing on the waterproof postcards and then diving down in the ocean to post to the only underwater post office in the world. 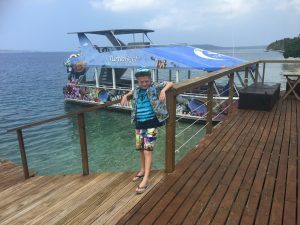 It was a great suprise when we got home to see our postcard had been delivered from Vanuatu and bring back the memories of diving down to post it. Turtle Reef Cruises operate from the beautiful Havannah harbour, next door to Francescas Restaurant. The cruise is a great way to see the ocean with a huge glass bottom all the way along the middle of the boat. 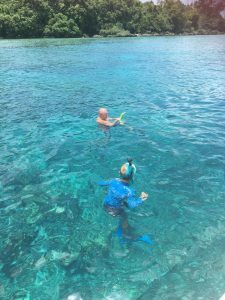 We could see the amazing coral, turtles, fish and marine life without even getting in the water. We then anchored off and snorkelled around seeing it up close, it was magnificent. An island stop off with the local mamma’s and children with market stalls selling there beautiful Vanautu jewellery and handicrafts right on the beach. 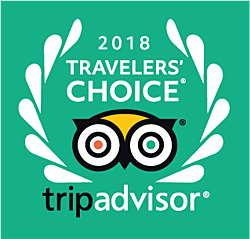 We trust you will enjoy Vanuatu as much as we do.